BeagleBone is an inexpensive web server, Linux desktop, and electronics hub that includes all the tools you need to create your own projects--whether it's robotics, gaming, drones, or software-defined radio. If you're new to BeagleBone Black, or want to explore more of its capabilities, this cookbook provides scores of recipes for connecting and talking to the physical world with this credit-card-sized computer. All you need is minimal familiarity with computer programming and electronics. Each recipe includes clear and simple wiring diagrams and example code to get you started. 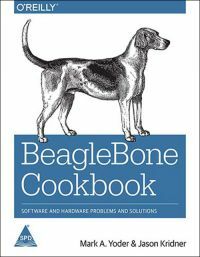 If you don't know what BeagleBone Black is, you might decide to get one after scanning these recipes. Mark A. Yoder is a professor of Electrical and Computer Engineering (ECE) at Rose-Hulman Institute of Technology. In January 2102, he was named the first Lawrence J. Giacoletto Chair in ECE. He received the school's Board of Trustees Outstanding Scholar Award in 2003. Dr. Yoder likes teaching Embedded Linux and Digital Signal Processing (DSP). He is coauthor of two award-winning texts, Signal Processing First and DSP First: A Multimedia Approach, both with Jim McClellan and Ron Schafer. Mark and his wife Sarah have three boys and seven girls, ranging in age from 12 to 31 years old. Jason Kridner is the cofounder of the BeagleBoard.org Foundation, a US-based 501(c) nonprofit corporation that provides education and promotes the design and use of open source software and hardware in embedded computing. As a more than 20-year veteran of Texas Instruments and the semiconductor industry, Kridner has deep insights into future of electronics, pioneering both TI's and the semiconductor industry's open source efforts and engagements with open hardware. In his free time, Kridner uses BeagleBone Black to explore his creativity with creations like the StacheCam, which uses a webcam and computer vision to detect faces and superimpose fancy mustaches.